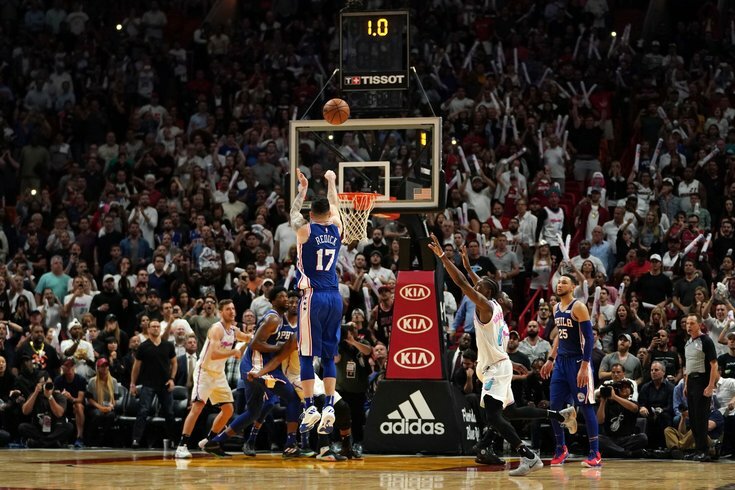 Philadelphia 76ers guard JJ Redick attempts a last-second shot that would not go in as the Miami Heat win 102-101 at American Airlines Arena. A seven-game Philadelphia winning streak had Sixers fans believing the darkest days were behind them. The turnovers had been cut down, blown leads turned into miraculous comebacks, and the Sixers were closing in on the top half of the Eastern Conference. They're certainly not "back where they started," but the Sixers picked up their second-straight loss in heartbreaking fashion on Tuesday night. And for a second consecutive game, the Sixers fell to a team they're battling for positioning in the playoff picture, ceding ground they gained over weeks of hard work. In some respects, their 102-101 loss to the Miami Heat is just life as an NBA team. The Sixers certainly didn't have their best game, and some of their key contributors dealt with issues all night. Joel Embiid couldn't keep himself out of foul trouble, Robert Covington remains cold from beyond the arc, and the Sixers got played off the floor whenever Amir Johnson had to step in. But they still outpaced Miami for the majority of the game, and had every chance to win it in crunch time. After Dwyane Wade hit a ridiculously tough step-back jumper to put Miami in front with six seconds left, the Sixers had the ball in their hands and the game on the line. A Ben Simmons drive was walled off by Miami's defense, and rather than bulldozing through, he hit an open Dario Saric in the corner, and Saric found JJ Redick wide open at the top of the key. Every single team in the league would take this look given the situation, especially when an all-time great shooter is the guy with the ball in his hands. Brett Brown and his players said as much after the game, telling reporters they were disappointed with the result but more than happy with the process. "I'll take JJ Redick wide open any day of the week. You're not going to get a better look than what you got," said Brown. "He just missed short." The look they did get was created in part because of the way Miami played the inbounds play. Speaking to reporters after the game, Redick revealed it was Embiid who was the No. 1 option on the play, but the entry was prevented by Dwayne Wade sagging into the passing lane. He credited Simmons for collapsing the defense and finding an open Saric, and took responsibility for the shot not going down. "I think Dario made a great pass," said Redick. "You can't ask for a better look. I don't know if I rushed or not, but I would have liked to set my feet a little different. Other than that, can't ask for a better look." There were lots of smaller plays that put Redick and the Sixers in a position where the game was in his hands. Simmons and Saric fouled Wade on separate jump shots in the fourth quarter, biting on the exact same pump fake he has used to get defenders in the air for years. It's hard to kill young guys for falling for a move that seasoned veterans have eaten up, and it was an insanely weak call. That said, if Wade is going to settle for a fadeaway three-point shot from the corner, you let him have it, rather than giving officials a reason to make the call. Even if he's the one leaning in to make contact here, the future Hall of Famer is going to get the benefit of the doubt. The officiating in Miami was rough, as it has been around the league for most of the season. Matters were complicated further when a member of the officiating crew left the game at the start of the second half, tended to by trainers for both clubs. With less eyes on the court, the inconsistent whistles were even worse, undercutting both teams at points throughout the game. But the Sixers didn't do themselves a lot of favors with the refs. Embiid entered the fourth quarter with four fouls already in the books, and in an effort to contest a Kelly Olynyk shot on the perimeter, an overzealous Embiid made contact with his arm and picked up his fifth with 10:49 to play. For a guy who struggled to do so in college, Embiid has been better than expected at managing foul trouble in the pros. But a play like this is where his basketball inexperience pokes through a little bit. He's smart enough to know he shouldn't be putting himself in harm's way, and he can't help himself from trying because he's wired to compete on every defensive play. There's room to admire the intensity while also critiquing the decision-making; outside of an end-game scenario, there's no shot contest that is more valuable to the Sixers than the guarantee of him staying on the court. In that way, you can draw a straight line through the Saric and Embiid. Both guys are competing to the best of their ability, doing everything they can to get stops on the defensive end. But they are exposing themselves to risk in ways that are unnecessary. And then there was Simmons, who was asked to step up to the line and hit free throws in a tie game with 23 seconds left. He made one of two and put his team back in front, but that one miss represented the final margin. We talk a lot about what a difference it would make for Simmons to be a reliable jump-shooter, but being a consistently good free-throw shooter might be even more important in his path toward stardom. Tuesday night was a reminder that while the Sixers are more talented than they've been in years, they are still young and still figuring out how to consistently close out games. Unfortunately, the NBA doesn't award extra credit in the standings to young teams figuring it out. It's a painful loss they could have avoided, and time will tell how it hurts come playoff time. T.J. McConnell has been the first man off the bench for most of the last couple months, and really ever since Brown stopped subbing Embiid out early. But that changed on Tuesday night, with Marco Belinelli stepping into the sixth man role for the first time since joining the team. It's a move that makes sense on paper because Redick is always the first guy to leave the floor. Belinelli slides into that role comfortably, and the rest of the starters continue to do their thing. The veteran scorer went to work immediately after checking in, scoring a layup, and he contributed 13 points on 4/8 shooting from the field. Job well done. The more noteworthy change came later in the quarter, when Richaun Holmes checked into the game as the backup power forward, joining Embiid on the court after the pairing worked great on Sunday. Once again, Holmes gave the Sixers a great jolt of energy and they were comfortably better than Miami during his time on the floor. The bigger takeaway from that stretch was what it means for Trevor Booker, who was a DNP-Coach's Decision against Miami. Ersan Ilyasova's rumored signing is going to force a player off the roster, and the logical move is to cut Booker and bring in a better-fitting piece in Ilyasova. His contract expires after this season anyway, and the Sixers may have been doing a courtesy to protect a guy from possible injury when they know he's on the way out the door. We'll circle back on Holmes (and probably Ilyasova) a little later today, but Booker's tenure looks to be coming to a close in Philly.